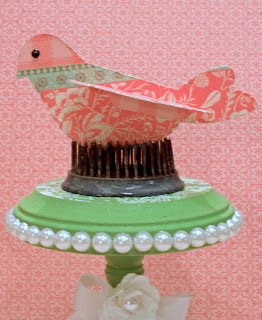 Today I wanted to introduce you to the new Sizzix Fresh Vintage Bird die. Can't you just picture this little cutie and about a dozen of her friends on a baby mobile? I think she would also be pretty darn happy at a bridal shower. She has wings on both sides (of course) - but if you left off one wing, she could also adorn a package or be part of a scrapbook page. Or even be the star of a pretty greeting card. Not sure if you can see, but I added a little bit of platinum Stickles around her edges. Who doesn't look better with glitter? The paper I used was not double sided, so I cut the die twice and adhered the pieces back to back. But with double sided paper, you could skip that step and be done in half the time. The next time I use this die, I am going to make a patchwork quilt bird. I will be sure to show you when I get it done. I might even break out the sewing machine for some added dimension. I will be back tomorrow to show you a bright and cheerful card.